I first came to Greenbelt back in the Deene Park days in the 1990s as a youth leader and group cook. I was fully able at that time, camped about as far away as possible and hoofed it. My last Greenbelt at that site was 1997, the one generally known as ‘Mudbelt’. In November 1997 I became ill and haven’t fully regained the use of my legs since. I became a virtual Greenbelter, I kept in touch through what was known then as the ‘Greenbelt Email Forum’, and I thought I would never go again. In 2002, however, having used a wheelchair for a few years, I bought a PowerTrike (a powered front wheel that clips onto a wheelchair, making it great on rough ground). My manual chair (which I use every day at work) would be useless at Greenbelt for me; I just don’t have the arm power. Then a Greenbelt friend asked: if he could pick up my tent, pitch it and be available to run my battery to the charging point, would I consider the drive to Cheltenham? Well, he did. I did. And I became a Greenbelter again! I wasn’t sure whether to laugh or cry all weekend – laughing at the knowledge that I was at Greenbelt again or crying at the wonderful generosity of a bunch people who actually cared whether I was around or not. I was thrilled to find out how much of Greenbelt I could manage. It was the small things that made such a difference – ramped kerbs, accessible loos and showers, somewhere to charge stuff and friendly folk willing to help. Eventually, having managed a few Greenbelts on my own, I volunteered with the Access Team, and looked after a small area of camping close to the festival. I worried about the move to Kettering. Having studied the maps in advance as an Access Steward, I knew that for people with mobility issues it was not going to be as easy as Cheltenham (with all its tarmac). That first year really was challenging. Yes. The ‘molehills’ in the Glade Arena, the uneven ground generally, and the mud caused me more than a few problems, especially on the long hill back up to my trailer tent. Last year, however, was a whole lot easier. Having early arrivals for Access Campers was really helpful. 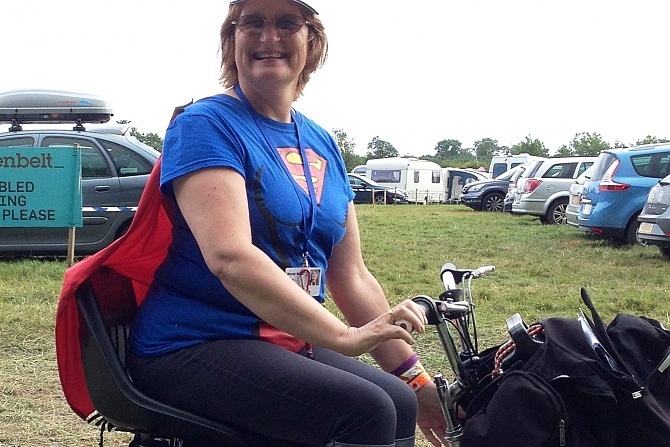 The tracking around the site was much better, the ‘molehills’ had been flattened, the viewing platform at mainstage was much easier to get to, the taxi-buggies were amazing – even big enough for my Trike. The flat-bed trucks that transported stuff to the camping areas were a huge hit. There were plenty of accessible loos and showers and even an assisted changing place with a hoist. There was a team looking out for people with both mobility and mental health issues, specific considerations for people with autism or similar, and so much more. The Access Team Leaders have a lot of experience and the amount of work they put in is phenomenal. It’s never going to be perfect. It’s still a big field when all is said and done. It gets muddy in the rain, and there are restrictions as to what can be done to it. But it’s still Greenbelt, and I’m glad to be part of it. PS If anyone would like to discuss specific access concerns, feel free to email me here and we will try to help. Don’t just take Wendy’s word for our commitment to making the festival as accessible as we can, check the findings of events access charity Attitude is Everything, who rank us second in the country for a greenfield festival, just behind Glastonbury Festival.